Pyrethrins are natural active ingredients of plant origin used in veterinary medicine in dogs, cats and livestock against some external parasites (lice, fleas, flies, etc). They are also used against agricultural and household pests. Mechanism of action: Pyrethrins have the same mechanism of action as synthetic pyrethroids. They act on the membrane of nerve cells blocking the closure of the ion gates of the sodium channel during re-polarization. This strongly disrupts the transmission of nervous impulses. At low concentrations insects suffer from hyperactivity. At high concentrations they are paralyzed and die. However, resistance to pyrethrins and all synthetic pyrethroids is already very frequent worldwide and can be extremely high, particularly in cattle ticks, horn & buffalo flies, houseflies, red fowl mites, mosquitoes, fleas, etc. Pyrethrins are considered quite safe for humans and domestic animals. But they can be irritant for the skin and the mucosal epithelia (eyes, nose, respiratory system, etc. ), also for domestic animals, but much less than for synthetic pyrethroids. Pyrethrins are very toxic to fish and to numerous beneficial insects. The insecticidal effect of pyrethrum and its extracts was already known in ancient times and such products have been used for centuries for this purpose. 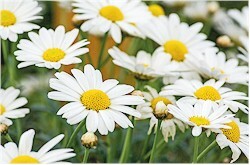 It is believed that powders of pyrethrum plants were already used as insecticides in China in the Xth century B.C. But the main chemical molecules (pyrethrins I and II) responsible for the insecticidal effect in the extracts were identified only in the fist half of the XXth century. Soon later both were synthesized in the laboratory. Most pyrethrins marketed today are not manufactures through chemical synthesis but are extracted from harvested plants grown for this purpose in several countries (e.g. Kenya, Croatia, Australia, etc.). There are thousands of products with natural pyrethrins, mainly for agriculture, horticulture, public and domestic pest control, but also for pets, mainly in low-cost brands. Usage in livestock is more modest. Use in DOGS & CATS: Yes, abundant. Less in cats because cats may not tolerate pyrethrins and/or synthetic pyrethroids. Reported in livestock & horses: Yes, as for all synthetic pyrethroids: very frequent worldwide in such species as cattle ticks (Boophilus spp), horn flies (Haematobia irritans), sheep lice (Damalinia ovis), poultry mites (Dermanyssus gallinae), houseflies (Musca domestica), mosquitoes. Reported in pets: Yes, quite frequent worldwide in dog and cat fleas (Ctenocephalides spp). For this reason, many veterinary antiparasitics with natural pyrethrins contain other insecticides and/or a synergist (often PBO = Piperonyl butoxide). The synergist in the formulation is supposed to neutralize resistance of parasites to insecticides. However, PBO works only against so-called metabolic resistance (enhanced detoxification) caused by mixed function oxidases (= MFO), which is one among several mechanisms by which parasites can become resistant to insecticides. PBO specifically inhibits the activity of MFOs. If metabolic resistance is caused by other enzymes than MFOs, or if resistance is (also) due to other mechanisms such as target site insensitivity, reduced penetration or behavioral modifications, it won't be neutralized by PBO. In the vast majority of cases producers or pet owners facing parasites resistant to pyrethrins and synthetic pyrethroids do not know which mechanisms make the parasites resistant, and it is mostly not possible to find it out. Consequently, whether the synergist PBO helps to overcome resistance or not is in fact a lottery. Obviously, if a particular brand contains a synergist such as PBO or other synthetic insecticides it cannot be labeled "biological", "ecological" or anything similar suggesting a natural origin. In addition to their insecticidal properties, pyrethrins also have a repellent effect against mosquitoes and to a lesser extent against other flying insects. But it lasts only a few houres after treatment, if at all. Pyrethrins are certainly the most used natural insecticides worldwide. However, resistance is already very frequent. They share two features with many other natural insecticides: they are rather volatile and are unstable when exposed to sunlight. Consequently their effect in animals exposed to sunlight is very short: a few days or even only a few hours. This means that protection of the treated animals against re-infestations (residual effect) is virtually inexistent. This is particularly unfavorable for livestock that would need to be treated very frequently. However, for the same reason they do not leave chemical residues in food commodities (meat, milk, eggs, etc. ), which is a benefit sought by organic producers. 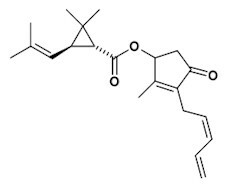 The lack of residual effect was the reason why synthetic pyrethroids (permethrin, cypermethrin, deltamethrin, etc) were developed in the 1970-1980s modifying the pyrethrin molecules in the laboratory. Most synthetic pyrethroids are less volatile, resistant to sunlight, and can protect treated animals against re-infestation during several weeks or even months. Synthetic pyrethroids have been massively used in livestock and pets in the 1990s-2000s. They are still used a lot, but usage is declining due to resistance and the introduction of newer chemicals without resistance. Another disadvantage of pyrethrins and other "natural products" extracted from plants is that quality (and thus efficacy) may vary, even if used following the label instructions, because producing extracts from heterogeneous plant materials is often less reliable than chemical synthesis.